The head of Cornell University's Agricultural Experiment Station said that weather in the Northeast will feel more like it does in Alabama or Georgia by 2080. "Climate change is personal," Mike Hoffman said. "I'm not talking about someone who isn't born yet. I'm talking about that younger person who's very special to you." Hoffman said that humans have been slow to react to the looming crisis because "our brains aren't wired" to take action to a slow-approaching threat. "We're fine in a situation where there's a car coming at you in your lane, but we're not very good at reacting to something like this." Hoffman, who delivered his keynote address to the packed main tent last week at the Plant Science Day sponsored by the Connecticut Agricultural Experiment Station, said that human-induced global warming will mean that farmers in the Northeast will have to switch to warm-weather crops as summers stretch out several more weeks. It might even be possible to harvest twice off the same field in the same summer, something that's been unheard of in Connecticut. "That line is going straight up," he said, showing a graph with the increase in atmospheric carbon dioxide since the 1800s. "We've gained 1.5 degrees Fahrenheit since the 1800s, and the temperature is growing twice as fast at the poles. The summer ice cap is 40 percent lower than it used to be and by 2100, the oceans will be up by 3 feet. That's a pretty serious increase. And by then we'll have 50 days above 90 every year." He said that we can expect hotter, drier summers in the Northeast with more episodes of damaging rain events. "Already, we're one USDA plant hardiness zone warmer than we were in the 1990s," he said. "It's as if we're moving south by 30 yards every day." As for the rest of the United States, consumers can expect higher prices for produce as crops fail in California because of drought. Irrigation water will also be in short supply as aquifers dry up in parts of the United States. "That was predicted about 12 years back and now it's happening," Hoffman said. These problems elsewhere in North America could offer some good news for Connecticut farmers, however. "There is 20 percent of the U.S. population in the Northeast and that's something that we can take advantage of," he said. He was encouraged, he said, by the 81 percent of those polled in New York state agreeing that human-induced climate change is indeed a real threat. The 104th annual Plant Science Day event at the Experiment Station's historic hilltop Lockwood Farm in Hamden attracted about 500 people including farmers, academics, Girl Scouts, landscapers and garden club members. The speakers included Gov. Dannel P. Malloy, the first sitting governor to visit Plant Science Day since Gov. Lowell P. Weicker Jr. did so in 1991. 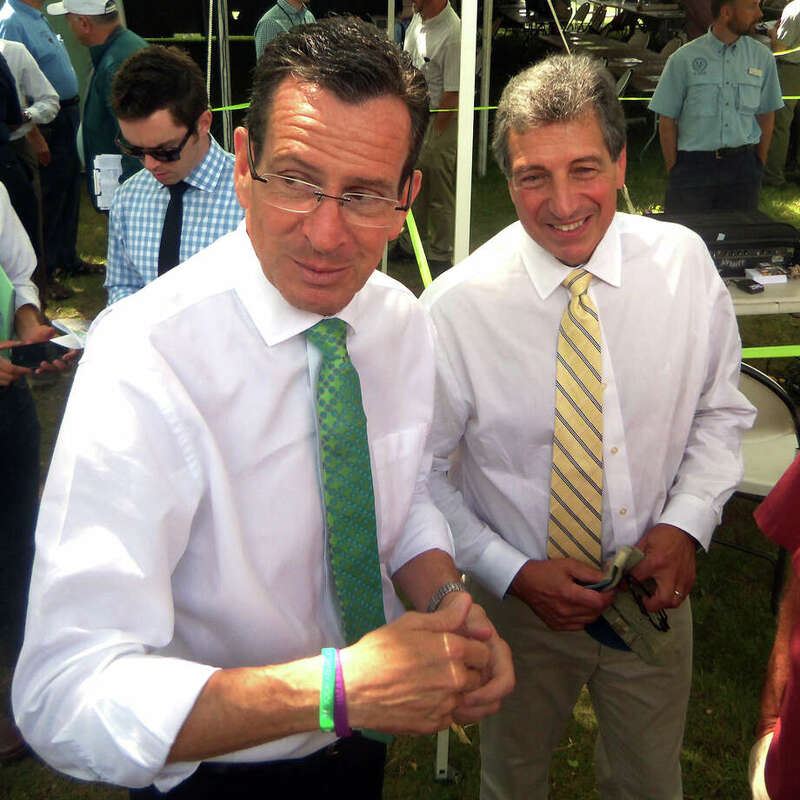 "Farming employs 28,000 people and contributes $3.5 billion to the state's economy," Malloy said. "And according to the USDA, agriculture grew by 22 percent in the last five years. This means that Connecticut is leading New England in the re-establishment of farmland, something that I'm very proud of." The governor said that the state has a program in which farmers are given grants to turn fallow, abandoned acreage back into production. "What consumers want is locally grown raised meat, poultry and produce, including honey," he said. "We've made it less burdensome to raise poultry in the state, and in fact there are 2,000 more turkeys at Ekonk Farms (in Moosup) as a result of legislation that we changed. And, by the way, they're great turkeys." Malloy said later that he didn't grow up on a farm, but still had a hand in agriculture while a lad in the Springdale section of Stamford. "My aunt had a blueberry patch, and when we got the call, we had no choice, but to rush over there and pick blueberries."